Spain’s Socialist party (PSOE) says it plans to present two legislative proposals to Congress aimed at ensuring that employers are paying women and men equal amounts for equal work, as currently required under Spanish law. 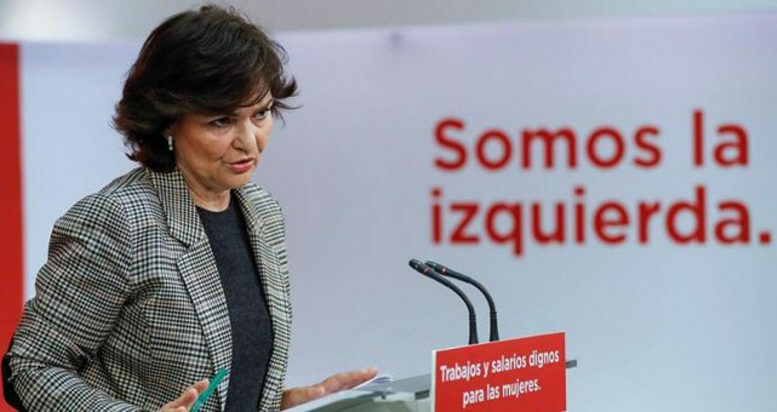 The measures, outlined last week by the PSOE Equality Secretary Carmen Calvo, would provide for effective workplace monitoring by government inspectors for violations of equal-pay laws by employers and dispute resolution through arbitration, without subjecting employees and unions representing them to the high cost of taking employers to court. The Socialists’ plan for tackling the pay-gap issue in Spain comes less than two weeks after an on-air gaff by President Mariano Rajoy of the Partido Popular, in which he told a radio Onda Cero interviewer that when it comes to resolving the problem of unequal pay for women doing the same jobs as men “We’re not getting involved in that”. According to Calvo, the PSOE plan would change legislation to ensure that existing workplace health-and-safety inspections include monitoring workplaces and interviewing employees to detect violations of current laws requiring that men and women are paid the same for the same job description. “We want there to be a structure that monitors, controls and serves as a space for vindication and resolution before the arrival to the courts”, Calvo told reporters. Attempting some damage-control over Rajoy’s remarks and following announcement of the PSOE’s plan on Friday, Minister of Employment and Social Services Fátima Báñez testified in the Senate on Tuesday that violations of Spain’s equal-pay laws are currently at “historic lows” while the number of women in the workforce is today at a “maximum” level. In her testimony, Báñez also claimed that between 2012-17 her ministry carried out more than 37,000 inspections and interviews as part of its monitoring of potential violations of equal-pay legislation. According to government figures published widely in the Spanish press, women in Spain currently earn 14.9 percent less per hour on average than do men, while the average annual take-home pay for a woman in Spain is 22.9 percent less than that of a male colleague performing the same work.